Sen. Kirsten Gillibrand (D., N.Y.) finished behind two undeclared New York presidential candidates and just ahead of Rep. Alexandria Ocasio-Cortez (D., N.Y.) in a new poll asking voters which Empire State politician would make the best president. A Quinnipiac poll of New York registered voters showed Gillibrand, who announced her run for the Democratic nomination last week, coming in third behind former New York City Mayor Michael Bloomberg (28 percent) and New York Gov. Andrew Cuomo (17 percent). Gillibrand received 11 percent of the vote. Bloomberg has expressed interest in a bid, while Cuomo has said he will not run. Gillibrand finished 4 points ahead of Ocasio-Cortez (7 percent), the rising democratic socialist star. She's only 29 and couldn't run for president next year anyway. Rounding out the list was New York Mayor Bill de Blasio (5 percent). A full 33 percent answered "Don't know / not applicable," the Albany Times-Union reported. 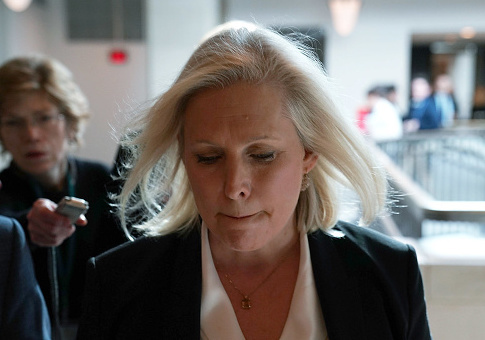 Gillibrand's favorability rating (41 percent to 30 percent unfavorable) and job approval (46 percent to 35 percent disapproving ) were at their lowest in nearly a decade, according to the poll. "While Democratic Sen. Kirsten Gillibrand sailed to re-election in November, New Yorkers aren't showing as much enthusiasm about her presidential bid in 2020. Even though she has served in the Senate for a decade, roughly a quarter of New Yorkers say they don't know enough about her to form an opinion. That number jumps to 48 percent among young voters," said Mary Snow, polling analyst for the Quinnipiac University Poll. Gillibrand has taken criticism from two New York editorial boards for misleading voters about her White House ambitions while she ran for reelection to her Senate seat. She pledged to serve a six-year term, but almost immediately after winning in November, she said she was thinking about running for president. She has also been hit with questions about her past positions on illegal immigration and guns, which put her more in line with today's Republican Party. She has said she is sorry and even "ashamed" over her past positions. This entry was posted in Politics and tagged 2020 Election, Alexandria Ocasio-Cortez, Andrew Cuomo, Kirsten Gillibrand, Michael Bloomberg. Bookmark the permalink.